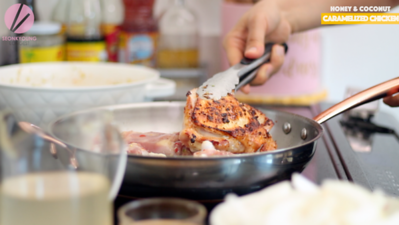 Today we’re going to make deliciously caramelized chicken thighs with honey and coconut water! I received a special gift from all the way London and it is a beautiful cookbook “The Little Viet Kitchen” by Thuy Diem Pham. 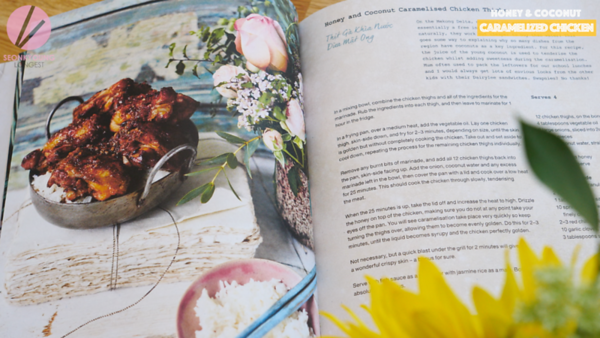 This cookbook is packed with authentic Vietnamese recipes by Thuy and each recipe is coming with her little lovely story. I love reading so even though it’s cookbook, I love to know read author’s stories. 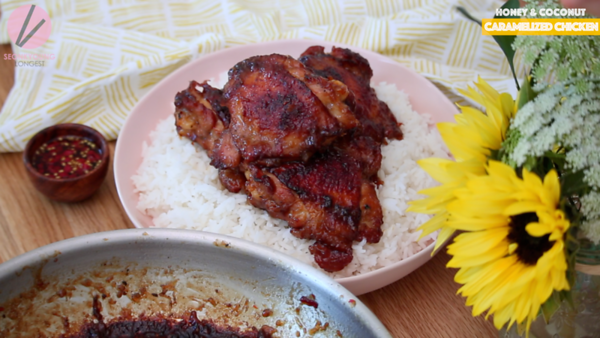 Caramelized Chicken recipe I’m sharing today is from the cookbook and I can’t wait for you guys to try!! It is so delicious, proven by me!! 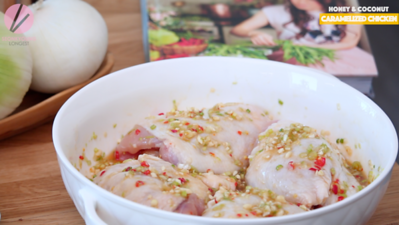 Thuy, the author of the cookbook said her mom often used to pack the leftovers for their school lunches and she would always get lots of envious look from the other kids with their Dairylee sandwiches. What a sweet story! 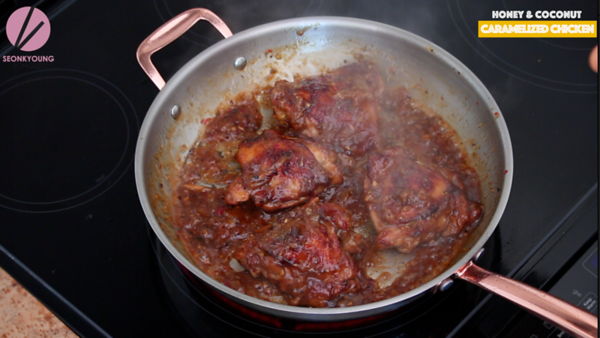 For the tasty result, this caramelized chicken is way easy to cook, you must try! 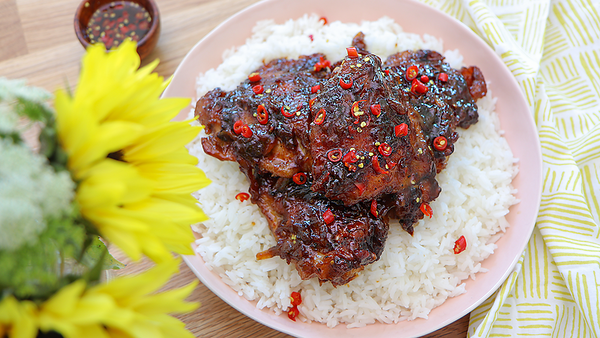 Usually a good chicken recipe starts with delicious flavorful marinade and so as The Little Viet Kitchen‘s caramelized chicken. Combine chopped green onion, red chili, garlic, fish sauce, sugar, salt and sesame oil, mix well and then add chicken thigh to rub the marinate evenly. Mrinade the chicken in a fridge for 1 hour. 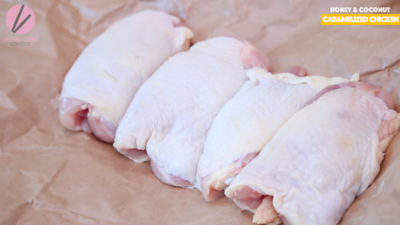 Using chicken is highly recommended because we are going to cook them for awhile so we don’t have to worry about if chicken is dry out or anything. We all want juicy chicken, right?! 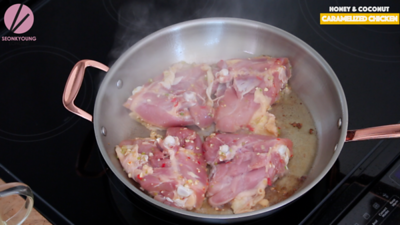 Remove any burnt bits of marinade, and add all of the chicken thighs back into the pan, skin-side facing up. Add the onion, coconut water and any excess marinade left in the bowl, then cover the pan with a lid and cook over a low heat for 25 minutes. This should cook the chicken through slowly, tenderizing the meat. 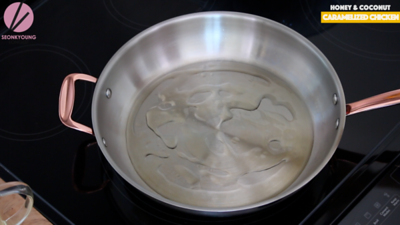 When the 25 minutes is up, take the lid off and increase the heat to high. 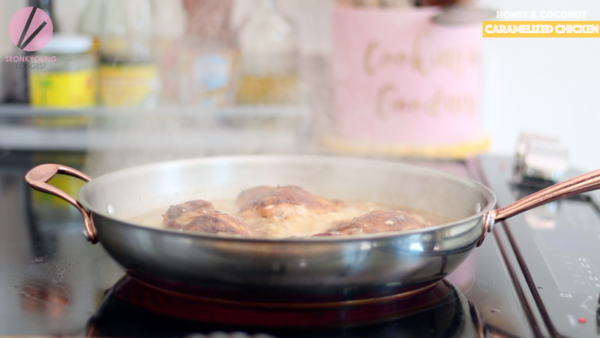 Drizzle the honey on top of the chicken, making sure you do not at any point take your eyes off the pan. You will see caramelization take place very quickly (it took 20 minutes for me on my electronic stove) so keep turning the thighs over, allowing them to become evenly golden. 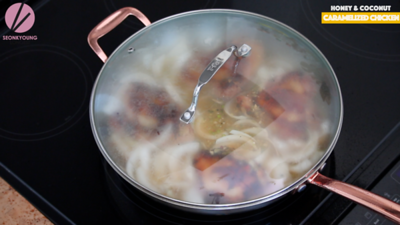 You will see the liquid becomes syrupy and the chicken perfectly golden. Not necessary, but quick blast under the broiler for 2 minutes will give a wonderful crispy skin- a bonus for sure. 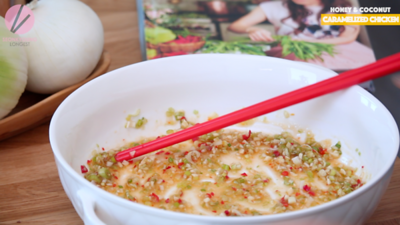 Serve with fish sauce as a starter, or with jasmine rice as a main. I made chili fish sauce, which is just add chopped Thai chili into fish sauce.. and I served over a warm jasmine rice! 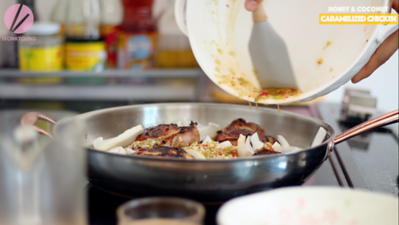 In a mixing bowl, combine all of the ingredients for the marinate and the chicken thighs. Rub the ingredients into each thigh, and then leave the marinate for 1 hour in the fridge. 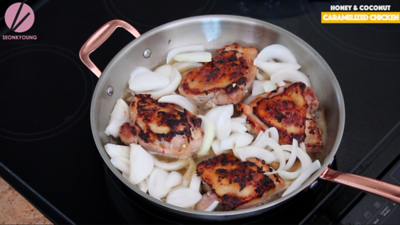 Remove any burnt bits of marinade, and add all of the chicken thighs back into the pan, skin-side facing up. Add the onion, coconut water and any excess marinade left in the bowl, then cover the pan with a lid and cook over a low heat for 25 minutes. This should cook the chicken through slowly, tenderizing the meat. 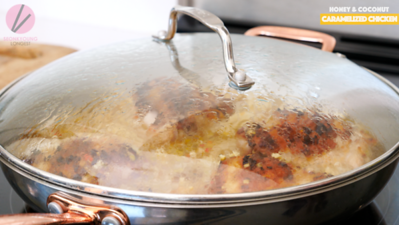 When the 25 minutes is up, take the lid off and increase the heat to high. 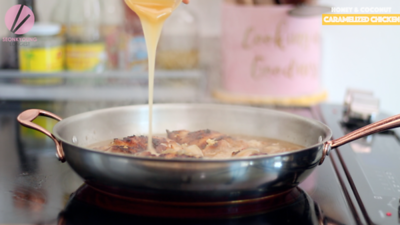 Drizzle the honey on top of the chicken, making sure you do not at any point take your eyes off the pan.You will see caramelization take place very quickly (it took 20 minutes for me on my electronic stove) so keep turning the thighs over, allowing them to become evenly golden. You will see the liquid becomes syrupy and the chicken perfectly golden. Serve with fish sauce as a starter, or with jasmine rice as a main. Both are absolutely delicious. 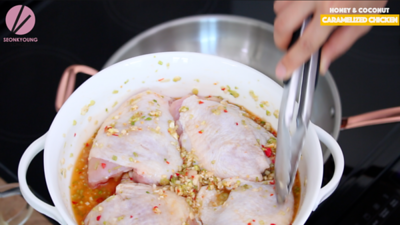 Can we marinate the chicken and leave it over night? 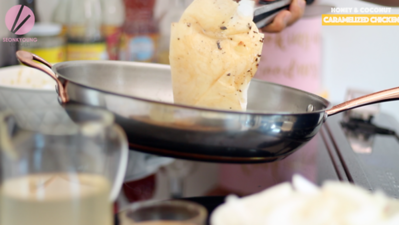 Which is the best fish sauce? What i get in the market, it has a very strong smell. Or do all fish sauces smell that way? 20 minutes for caramelization with after addition of honey??? Don’t you mean 20 seconds?? ?